Metro Property Development has sold 90 per cent of its new Highbury project in Footscray within 48 hours of launching. According to Marshall White Projects, who is marketing the project, prospective purchasers lined up at the door to the sales office from 7.30am before signing unconditional contracts on the day in order to secure their preferred home. “This particular project has witnessed such incredible success in large part due to its unique offering of town homes in this sought-after location as opposed to apartments,” said Marshall White Projects Director Leonard Teplin. “There are numerous apartment developments within a three kilometre radius of the location however until now there had been little by way of town homes. “Considering buyers are fast being priced out of the established home market due to West Footscray’s proximity to the CBD and the restrictions that come with apartment living for young families, Highbury’s town homes offer an attractive opportunity to purchase a large three or four bedroom dwelling for well under the median home value. “Of the town homes sold over the opening weekend 90 per cent of those were purchased by owner occupiers either with young children or planning a family in the not too distant future. 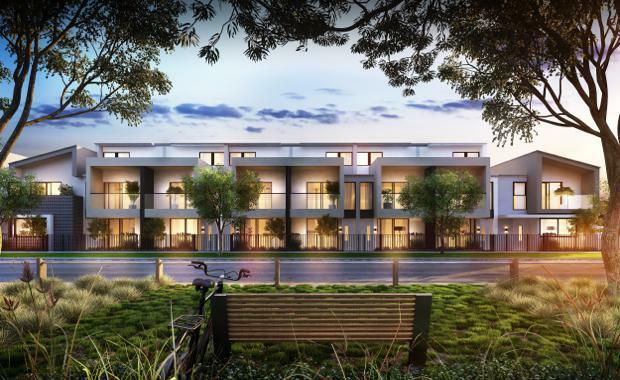 "Highbury offers architecturally-designed collection of three and four bedroom town homes starting from $589,000 and positioned just seven kilometres from the CBD. As Stage One of Highbury is now 100 per cent sold after just seven days on market, Stage Two has been fast tracked to launch prior to Christmas.